MATTHEW LOGAN FELT READY for his first year as Kingwood High School’s new theatre teacher. He had selected a season of plays and even begun rehearsing for the year’s opening production. In keeping with Kingwood tradition, students eager to be fully fledged Thespians had earned points toward membership in Troupe 4185 by decorating, painting, andotherwise preparing the school’s theatre spaces for the coming year. But just a week after they put final touches on classroom walls, Hurricane Harvey made landfall in southeast Texas. The Washington Post reported that Harvey unloaded approximately 50 inches of rain — roughly a year’s worth — in a handful of days. 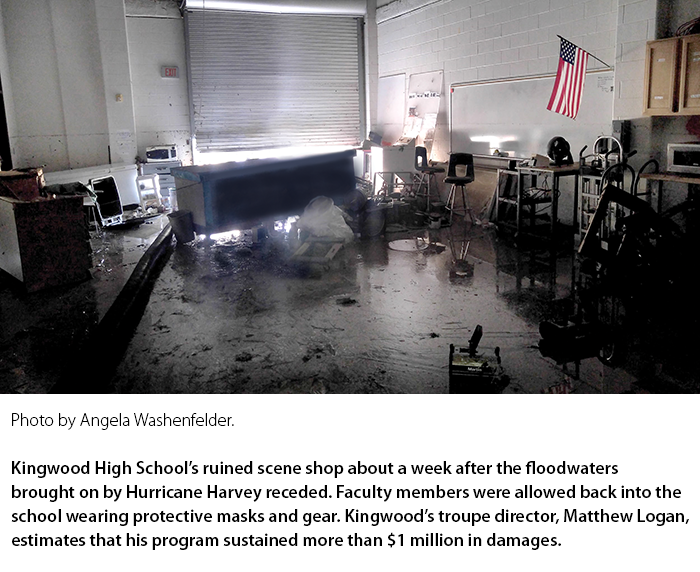 Located just north of Houston in a quiet suburb, Kingwood High School was decimated by the endless downpour and unprecedented flooding. In early September, school officials announced that Kingwdood would not reopen in the 2017-18 school year, and the entire student body would attend another Houston-area school: Summer Creek High School. 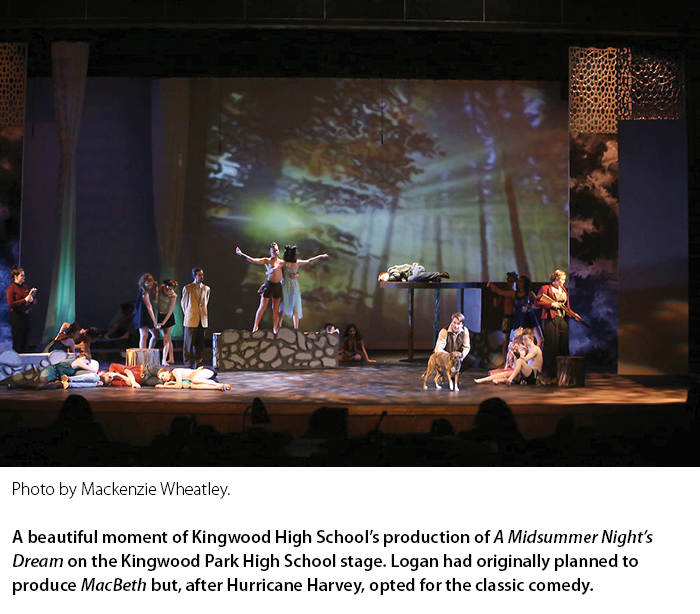 Kingwood Thespians expected a lock-in to be the first event of the school year, but Harvey had other plans. “Our actual first event of the year,” Logan said, “was to help other members of the drama club move their stuff out of their homes and tear down walls.” Logan said his students have risen to Harvey’s every challenge. Abbey Fera, director of Thespian Troupe 7528 at nearby Kingwood Park High School invited Logan’s theatre program to her school to share facilities, rehearse, and produce shows. Fera began her teaching career at Kingwood High School about a decade ago. When Logan was allowed back into his school, Fera went with him. She suggested a matching program: schools in need could fill out one form and schools eager to give could fill out another. Willeby would then pair those in need with those who could help. She created two Google forms, made a post on Facebook, and turned her attention to other projects — expecting to market and promote the new matching program over the course of the coming weeks. Within days, about 170 schools from across the country had offered support to 20 schools in the Houston area through the Texas Thespians matching program. It became clear to both Willeby and Texas Chapter Director Amy Jordan that even in areas where schools remained intact, the homes of many Texas Thespians and the livelihoods of many families suffered major setbacks or were washed away entirely. The Texas Thespian board decided that, instead of collecting material goods like costumes and props, they would focus their efforts on raising funds through the matching program to help a Texas Thespian attend the Texas chapter Thespian event. Because of these efforts, 85 Texas Thespians who might otherwise have missed their annual chapter event were able to attend. Jordan placed a call to the Educational Theatre Association’s National Office in Cincinnati, headquarters of the International Thespian Society. Diane Carr, EdTA’s director of chapters and communities, and Hans Weichhart, EdTA’s chief relationship officer, responded by devising a disaster relief program that could match schools that had props, costumes, or scripts they wanted to donate with schools that had lost materials. Sarah Specksgoor is executive officer of Thespian Troupe 6861 at Morton Ranch High School just outside Houston. While her family’s home weathered the storm, her father’s business sustained a great deal of damage, as did the businesses of many of his clients. Her troupe, led by Texas Thespian board member BK Goodman, didn’t hesitate: the group volunteered to help clean out her father’s office space, down to the studs in the walls, so the family could begin to rebuild. A native of Kingwood, theatre educator and Thespian troupe director Stacy Castiglione at Los Alamitos High School in Orange County, California, spent her childhood attending Kingwood football games and watching productions on the Kingwood High School stage. 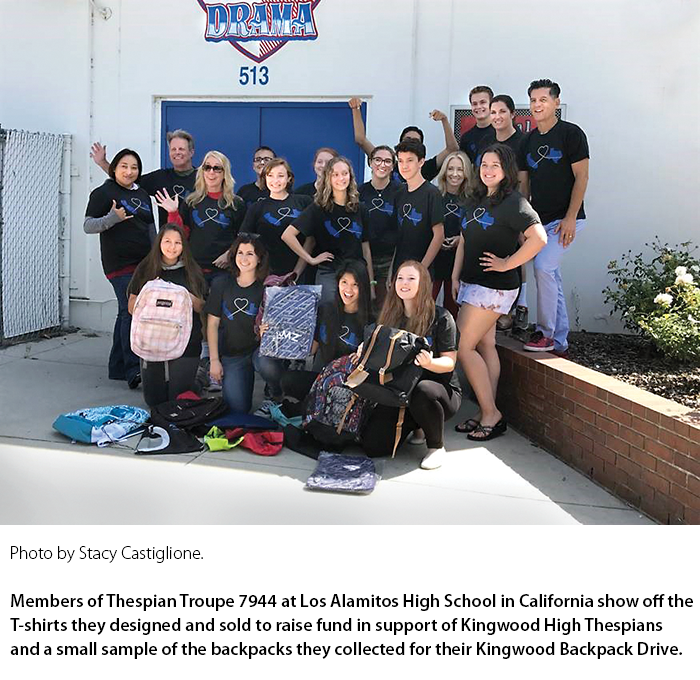 Matched with Kingwood High School, Castiglione rallied her California troupe, which quickly launched a fundraising and relief effort they dubbed “Houston, We Have a Solution.” So far, the Los Alamitos Thespians have sold T-shirts and wristbands, created a Facebook page and a GoFundMe campaign, and sponsored a backpack drive, shipping 16 boxes of backpacks to Kingwood students in need. Logan and Fera have committed to having the best year possible, complete with uplifting material and exciting opportunities to collaborate. They decided to make the most of sharing a theatre space. Instead of stressing over the complicated logistics of producing entirely separate seasons, the pair seized a rare opportunity: Fera’s and Logan’s theatre programs will stage a joint production of Fiddler on the Roof. Since Harvey, hurricanes Irma and Maria have slammed Florida and Puerto Rico, leaving poisonous floodwaters and crises in their wakes. Wildfires have scorched California. When disaster strikes, people must rely on their communities to heal and rebuild. Theatre cultivates strong, resilient communities. And Thespians, no matter where they are in the world, are all part of the same community.